Professor Emeritus, University of Wisconsin-Milwaukee. Born in Surat, India. He did his BA and LLB from Bombay University and PhD from London in 1950 in Arabic & Islamic Studies.He taught in Karachi University 1951-62; in Cairo University 1962-69 and since then at University of Wisconsin-Milwaukee until his retirement in 2001. He is author of many books. Dr. Abbas Hamdani’s talk at the Husain Day meeting on Sunday, October 12, 1986 at the Elks Lodge, 82-10 Queens Boulevard., Elmhurst, New York 11373. The topic allotted to me is the “Significance of Karbala in the early Islamic history.” The Battle of Karbala fought in the beginning of 61 H. /681 A.D. has been described by historians in such great detail as very few battles in history have been, not only in terms of military skirmish but in terms of the political, social, and religious and above all the human drama that it unfolded. You already know that it was a battle between the party of Imam Husain, the grandson of the Prophet Muhammad (May peace be upon them) and the party of Yazid, the second Umayyad ruler who succeeded the previous year, his father Muawiyah, the founder of the Umayyad dynasty. You know that Imam Husain’s party consisted of his family and friends and groups from the Ansar of Medina and other tribes around Mecca, his devout followers. On the other side were the forces of Yazid. The previous governor of Kufa, Nu’man b. Bashir, had been replaced by the haughty and unscrupulous military commander Ubaid Allah b. Ziyad. A large army of men had been sent from Syria under the command of Umar b. Saad b. Abi’l-Waqqas. The cavalry was in charge of another military careerist Haseen b. Numayr and of course there was the relentless instigator Shimr b. Dhil Jawshan, the notorious agent of Yazid who saw to it that there was no slackening of the fight against Imam Husain, and who ultimately had the dishonor of beheading the Prophet’s grandson. 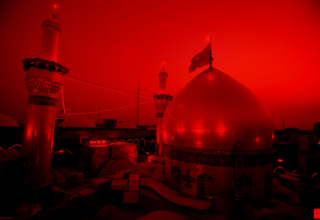 The Battle of Karbala was preceded by the reconnaissance mission of Imam Husain’s cousin Muslims b. Aqil. When he had gone to Kufa, Many Iraqi clans who had previously invited Imam Husain had in fact stood by Muslim b. Aqil in his resistance to Ibn Ziyad, but under pressure had deserted him, till Muslim and his host Hani were at last apprehended and very cruelly executed. But before that Ibn Ziyad had let Muslim’s report to Imam Husain pass without interception. It was on the basis of this report that Imam Husain had started from Mecca on his long and fatal journey, ironically on the same day. 8th, Dhil Hajj 60 H, /680 A.D., as the execution of Muslim in Kufa. The strategy of Yazid and Ibn Ziyad had been to lure Imam Husain out of the safe refuge in the sanctuary of Kaaba in Mecca and to trap him in his journey to Kufa. It is with this purpose that a certain Hurr b. Yazid Ryahi was sent to see to it that Imam Husain would not retrace his steps to Mecca: that Haseen b. Numayr was placed at Qadisiyya to see to it that Imam Husain does not cross the Euphrates to reach Kufa and that Umar b. Sa’d b. Abi-Waqqas was sent with a large army to surround Imam Husain’s camp preventing a march as well as a retreat and cutting off the water of Euphrates completely so that the Imam’s party would die of sheer thirst. It is at this time that Imam Husain facing Hurr’s men declared: “People, if you fear God and recognize the rights of those who have rights, God will be more satisfied with you. We are the house of Muhammad and as such are more entitled to Walayat I-Amr (the task of the government of the Muslim community) than these pretenders who claim what does not belong to them. They have brought tyranny and aggression among you. If you refuse (us) because you dislike (us) or do not know our rights, and your view has now changed from what came to us in your letters and what your messengers brought, them I will leave you.” However, the Imam was surrounded. Submission was demanded of him, which he valiantly refused to give. The tragedy of Karbala was then the outcome. 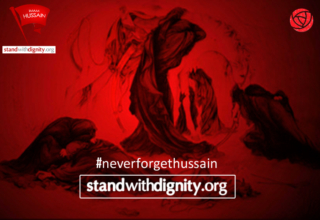 One can reflect on the above words of Imam Husain about the rights of the house of Muhammad – i.e. the Ahlul bayt. The leadership in a pre-Islamic Arabian tribe had been on the basis of Ijma (consensus of the tribal majlis) and a Bay’a an oath of allegiance to confirm and ratify. This had always been in favor of a dominant family within the tribe. So there was the concept of Bayt. In the Quraysh, it was the Bayt of the Umayyad and the leadership of Abu Sufyan. The concept of Ijma’ and Bay’a had been replaced by the concept of Nass (designation) of an Imam in the Prophet’s household. When the Prophet was returning to Medina from his farewell pilgrimage, he stopped at a place called Ghadir al-Khumm, where raising ‘Ali’s hand, he declared “Oh God, for whomever I have been a master, Ali is his master. Help, O God, who helps him and oppose one who opposes him.” This hadith is reported in the Musnad of Ahmad b. Hanbal and also by historian’s Yaqubi, Mas’udi, Ibn Khallikan, and many others, and of course in all the works of the Shiite tradition. This declaration of the Prophet is considered by the Shia to be the will of the Prophet at the order of Allah for ‘Ali’s succession – succession by a clear designation Nass jali. After the Prophet’s death the Islamic community was involved with external threats of the Wars of Ridda and the conquests and the Problems of a vast empire and administration and it got diverted from the rights of the Ahlul-Bayt till the eventual succession of Imam Ali as the 4th Caliph. After ‘Ali’s martyrdom and his son and successor Imam Hasan’s abdication to Muawiyah in 41/661, the family of Umayyad, the old aristocratic family of Mecca began to reassert itself. It is the Umayyad who had fought the Prophet bitterly in battle after battle till Mecca was conquered and they Joined Islam, mostly out of convenience. The position of power and prestige which they had lost by the defeat they suffered with Islam’s ultimate success, they now tried to regain from within Islam, by accepting, then dominating it. The leader of the Umayyad, Abu Sufyan had died shortly after the Prophet’s death. When Ali became the Caliph, he was challenged by the new Umayyad soldier, the governor of Syria, Muawiyah. It again became a struggle between the Ahlul Bayt of the Prophet and the clan of Umayyad. The abdication of Hasan’s was interpreted as the final victory of the Umayyad. However, Hasan’s agreement was conditional. It did not specifically surrender the rights of the Ahlul al-Bayt. It did not concede authority to the Umayyad’s permanently. It was an agreement for the life time of Imam Hasan and Muawiyah, and as such was respected by Imam Husain who never rose against Muawiyah as long as Hasan and Muawiyah both lived. On Muawiyah’s death no one expected that he would institute a dynasty. Besides, Husain b. Ali, there were other candidate for caliphate, ‘Abdullah b. Zubair, Abdul-Rahman b. Abi Bakr, Muhammad b. Talha, Abdullah b. ‘Umar, and Abdullah b. Abbas. Muawiyah had to manipulate and bribe the governors and power-brokers among the tribes to acquiesce to the succession of his son Yazid in preference to other grandees of Islam. When Yazid actually succeeded almost, all paid allegiance to him except Imam Husain and Ibn Zubair. Ibn Abbas formally submitted to Yazid but remained sentimentally bound to the Ahlul al-Bayt. The issue of leadership had now come into the last round of contest there was no longer the question of ijma and Bay’a. It was the choice of either the Bayt of the Prophet or the Bayt of the persecutors of the Prophet and his previous enemies the Umayya the old aristocrats of Mecca. Yazid’s accession seemed to be the success of the latter choice. Imam Husain resistance seemed to be the only honorable course for most Muslims. 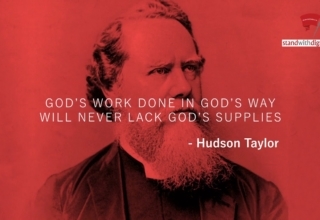 His martyrdom did not end that course; it only intensified it. That course was historically inevitable, despite the tragedy it involved; it was a course that opened the floodgates of opposition against the Umayyad’s and ultimately liquidated their aristocracy once and for all. 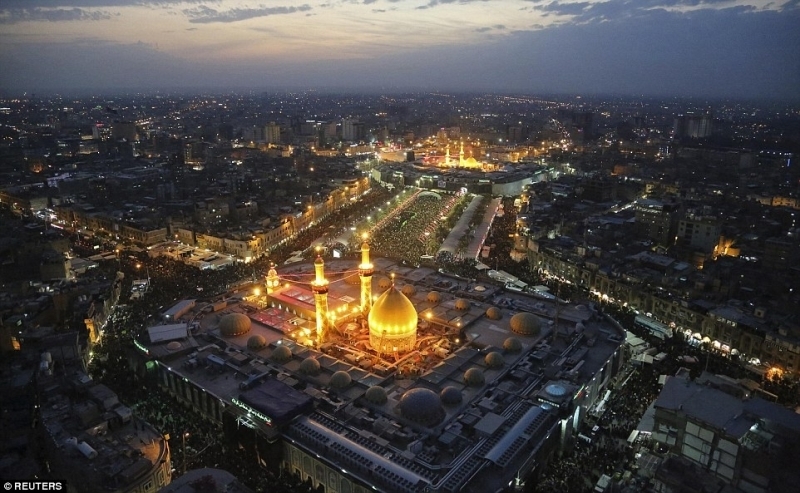 At Karbala and in the short term, however, it is the family of the Prophet that had suffered. Besides the friends and supporters, the immediate members of his family who were killed were Husain’s half-brothers ‘Abbas, Abdullah, Jafar and ‘Uthman, the sons of Ummul-Banin; ‘Abdullah and Abu Bakr, sons of Layla bint Masud al-Thaqafi, Imam Husain’s own sons’ Ali and Abdullah, the latter a mere child who was shot by an arrow when Imam Husain was holding him in his arms. Also his nephews al-Qasim, Abu Bakr and Abdullah, the sons of Hasan b. ‘Ali; also Muhammad and Aon the sons of Abdullah b. Jafar b. Abi Talib; three sons of ‘Aqil b. Abi Talib – Abdullah, Jafar and ‘Abdul-Rahman and Muhammad, the son of Abu Said b. ‘Aqil b. Abi Talib – seventeen members of the Ahlul-Bayt along with Imam Husain himself. Imam Husain stood bravely in the midst of the whirling storm of enemy horsemen all around him, striking him with 33 strokes of the lance and 34 blows of the sword, cutting through his body and skull, till he fell; and that notorious instigator Shimr b. Dhil Jawhsan came down to separate the Imam’s head from his body. The Imam was only 56 years old, but is eternal in the memory of the Muslim world. Of course it was the irony of the situation for the Umayyad’s that the house of the Prophet could not be wiped out. There were survivors – Ali Zayn al-‘Abidin, the son of Imam Husain by Shahrbanu, the daughter of the last Persian emperor Yezdgird III, Imam Husain sister Zainab, and his daughters Sukaina (Sakina) and Fatima. The line of the imam was to continue; the line of the Umayyad’s was destined to disappear sooner than expected. For the Shia, the Battle of Karbala produced another great lesson that the Imam is not only designate, but also a redeemer; one who willingly and knowingly suffered martyrdom so that the rights, the honor, the pride and the independence and self-respect of his people may be saved. The Imam became a savior, and to this day, the Shi’a in their matam every year remember this act of grace of Imam Husain. 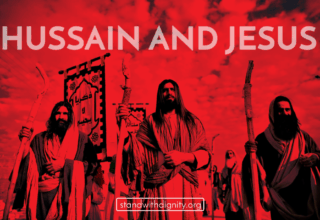 Not only for the Shia but for all Muslims Imam Husain martyrdom became the symbol of defiance in the face of tyranny greater than the defiance of David against Goliath. It became the symbol of every revolt and rebellion-first against the Umayyad’s and then later against other tyrannical rules. In modern times the anniversary of Karbala started the Iranian revolution in 1979. 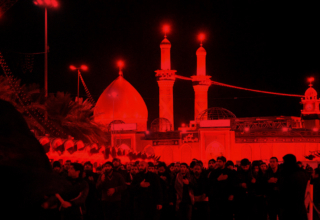 The Battle of Karbala can be viewed from three specific angles – military, Political and historical. We have described the military aspect: it was hardly a regular battle; it was a massacre of a small party, old and young, by a large regular army with overtones of revenge and vendetta. It was not real victory for Yazid nor was it a defeat for Imam Husain, for his cause lived on forever. In terms of a political decision, Yazid could have the satisfaction of having removed one rival from the scene. But it did not prove to be decisive. Another rival for the Caliphate Abdullah b. Zubair still lived at Mecca and Yazid could not outlive him. Abdullah kept on defying the Umayyad’s until the time of Abdul-Malik. From the psychological, emotional, religious and historical viewpoint. It was a great victory for Imam Husain and for the survival of the Islamic spirit. His martyrdom was never forgotten in Islamic history and kept on inspiring movements and revolts against any authoritarian and tyrannical regime in later history. One of the persons in Kufa who witnessed the brutal killing of Muslim b. Aqil and the entrapment of Imam Husain was Mukhtar b. Yusuf of the Thaqafi tribe of Taif. He became the leader of the Kufan opposition to Yazid, then Marwan and Abdul-Malik. He wanted to serve the new Shiite Imam Ali Zayn al-Abidin but the latter’s policy was of quiet resistance and of keeping a low profile for the safety of his supporters. So Mukhtar turned to the son of Imam Ali, Muhammad by his wife Khawla, a lady of the Hanifa tribe who is otherwise known as Muhammad b. al-Hanafiyya. He was now more than 50 years old. It is doubtful whether he actively supported Mukhtar’s movement but lent his name and prestige to the letter’s uprising against the Umayyad’s. Mukhtar’s influence in Iraq became so great that it almost brought the Umayyad rule there to an end. Abdul-Malik now committed all his Karbala victors against Mukhtar – namely Ubaydullah b. Ziyad. Umar b. Saad b. Abi’l-Waqqas, Haseen b. Numayr and Shimr b. Dhil Jawshan. They were to meet at the Battle of Khazir of 67 H. /686 A.D. by Mukhtar’s army led by Ibrahim the son of Imam ‘Ali’s famous general at Siffin, al-Malik al-Ashtar. The Umayyad army was routed and all the four villains mentioned above were killed. After the death of Mukhtar, Muhammad b. al-Hanafiyya’s son Abu Hashim re-gathered the fragments of his father’s movement and his new mission began to be called al-Da’wat al-Hashimiyya. Abu Hashim, however, died without a male heir, and at the time of his death was the guest in the house of the Abbasid claimant to the Caliphate Muhammad b. Ali b. Abdullah b. al-Abbas at Humayma in Palestine. Abu Hashim, on his death bed, advised his followers to join the movement of his Abbasid host. Thus the movement came to be known as al-Da’wat al-Abbasiyya al-Hashimiya. The Abbasids sent their Dai Abu Muslim al-Khurasani to lead their revolt against the Umayyad authority. They kept their organization and claims secret. The Abbasid revolution was couched under the rights of Al-Rida min al Muhammad (the accepted leader of the family of the prophet) another expression for Ahlul-Bayt. Thus the Abbasid movement itself was built on Shiite claims and expectations and its revolution carried out and won by Shiite supporters. At the victory at Kufa in 132/750, the Abbasid caucus succeeded in putting up the Abbasid Abu’l Abbas al-Saffah as the Caliph. Thus the Battle of Karbala in the long run had spelled the doom of the Umayyad dynasty. The chain reaction it set in resulted in the downfall of the Umayyad’s and the ushering in of the Abbasids. During the Abbasid times. It kept on inspiring both the Ithna-Ashari and Fatima Shia movements for the establishment of their respective ideal rules. It still keeps on inspiring every Muslim movement. Sunni or Shia, against tyranny and oppression and for social Justice and humanity-this at every place and at all times.